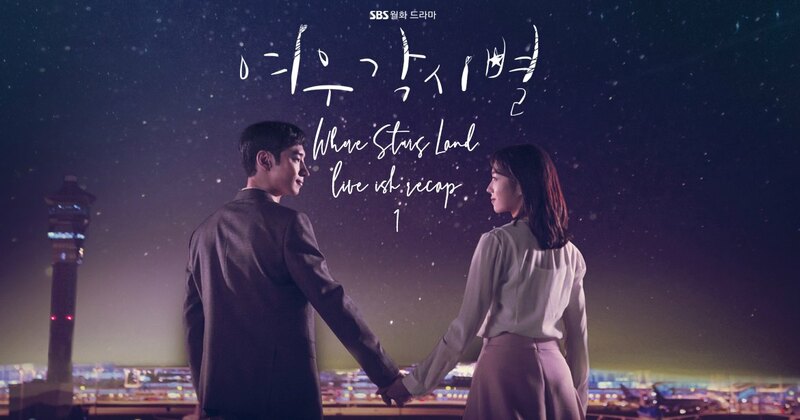 We heard good things about the first episode of Where Stars Land so we are excited to get into it so see what the charm is all about. Everyone has low expectations with this one so I can see how just the tiniest bit of good can blow some people away (like how Come and Hug Me was with me, also that show continued to be great). I love it when shows flip expectations in a good way. We are also going to try and recap The Beauty Inside today, but that is a strong “try” because our time is limited. If we do squeeze in some time then it might end up being a quickcap that we will try and post today or early tomorrow. We open on a map that is the backdrop to a desk. VO – A long time ago, Aboji told me that in the world, there is no coincidence, everything that happens in your life has a reason. The phone starts ringing in a persons room. She answers it while still being under the covers. A man calls her and tells her it is morning and her first day moving to a new deaprtment. She hops up, what time is it now???? He tells he to hurry and get ready otherwise she will be late. She sits in bed and sighs, then thinks, lets go. She hops out of bed nd gets ready. It starts raining on her. She runs to avoid the rain and ends up going to a cafe. there is a man standing in the cafe as well. They look at each other because she accidentally gets him wet. Her watch sticks to his arm as if magnified. She looks at her watch stuck to his arm and then looks at him. VO – In the world, there aer no coincidences, everything that happens to your life has its own reasons. Fade out on that scene with them both looking at each other. Scenes from the airplane and the control center at the airport as a plane is given the go ahead to land. Back at the cafe, the watch is still stuck to his arm. She apologizes and tries to pull her watch away, but it is really stuc and will not pull away. he softly pulls it away and tells her that it is okay. then he opens his umbrella and gets in a taxi. She looks at him in wonder and thinks that he looks familiar, where did I see him before? But as she wonders this, she misses her bus. VO – My name is Han Yeorum (summer) I have worked at the airport for one year. We see Yeorum running to her interview, her forhead is all bloody as she apologizes to the interviewees. She is out of breath and tells them that she had an accident but she is ready for the interview. They ask her to get treatment but she says NO the interview is more important! I failed three times, whatever happens , I MUST PASS. But she is about to pass out. All the interviewers are so cocerned and stand up. But she just says, I need to have this interv-i-e-w…..she passes out. All the men run to her side in concern. A woman interviewer who is also sitting in the room, casually calls 119 (like 911). VO – Because of my passion – I passed. I got my dream job of working in the airport. The manager tells the woman interviewer who is also the team leader that Yeorum is a time bomb, she is super late. But the team leader just tells him that he is the one that wanted more people. He argues like a child and says that they cannot just take anyone! The trffic team could not handle her. She did a roundhouse kick to a drunk person and has been in trouble every since then. But that is not all! Yeorum comes in while he is stating his case. He says that she argues a lot and has a record in the history of their airport with causing trouble. She made a grand slam in one year! She is the time bomb of all time bombs! Why do we have to have her here? It is an 8 time record for cursing. But Yeorum says it is 7 times. he turns around so she greats him and says that it was only 7 times of cursing, not 8 times. Then she smiles soflty. Elsewhere, there is a Westerly that is making airplanes land early, so they need to make a spot for this airplane. He talks to the Mooring team (ground team). It is a big hassle to them. Back in the office, teh ream manager reprimands Yeorum for surprising him and not telling him that she is there. The team leader SeoKoon tells Yeorum that she is great at kicking people and being late. But Yeorum says she will not do those things and will work hard. the team manager, SeongCHul, does not believe her. Someone else says that there is a customer argument with the employee and the self checkout machine. Team Leader Yang sends Yeorum to handle it. She says she will do it! But she runs off with her bags so the team leader tells her to put her bags down first, then she also has to give her instructions on where to go. She tries to keep from looking embarrassed and walks quickly in the right direction. the team leader tells the team manager that she is not a bomb, she is just a bit stupid. But he thinks that is a bigger problem. the team leader tells the manager that he should follow her if he is concerned. he thinks, should I? Me? he decides to tell Soo-yeon something. He tells hre to follow Yeorum. Sooyeon is all like, should I? the manager asks, should I? So Soo yeon leaves without answering. The manager is annoyed and complains about youngesters, but the team leader looks on with a warm smile. Meanwhile, Yeoreum is outside pumping herself up and simultaneously hitting her head on the wall. She tells herself that she needs to do well, if she is done in this department then she is done for good. She lifts her head up and heads to that department, though she does not know how to get there. Sooyeon looks at her all the while but she does not notice him. Yeoreum runs through the airport and we see just how large and busy this airport is. VO – Actually, I get lost sometimes. Flashback to when Yeoreum was a kid. Her father gave her a compass and tell sher that she will nto get lost with it. She is excited that she has a compass now. he tells hr that she can get lost but She tells him that she should not get lost. He says it is okay, so long as you know the directions, you can get lost and find your way back. But in the present, she says that it is not okay appa, this world makes you a loser as soon as you get lost. that is why I am trying so hard with all of my effort. I will not be noticed by anyone that I am lost. She gets to the self check area and asks where the self check booth is. Cut to a violent man hitting the booth with his suitcase. He keeps hitting it over and over again and yells for the boss. The woman working there told him that self check out is faster but then this happened. he yells that they want him to use this machine but they want everyone else to use people, why! he hits it a few more times. he also yells at Yeorum, I dont’ want to talk to you, bring the CEO! He kicks over the machine. Yeoreum gets a little angry and asks him what he is doing right now. He keeps hitting the machines and starts hitting other ones. He is really making her upset. She tries not hold her temper but finally calls him a crazy -. He asks her what she is about to say? A crazy A-hole? A crazy jerk? Flashback to Yeorum being reprimanded for calling a person a crazy a-hole. She is sitting in the bosses office as he stands at the window. He wants to know if she will waste her time there? Does she think she does not have to work hard after being hired? Do not think that way. Your job evaluation determines your life, companies are cruel like that. Cut back to the present with this man yelling right in her face in slapping territory. Che holds her mouth and says that she will not curse at him, of course not. But he grabs her by the collar and asks if she is laughing at him, I am the customer, I am your kind. VO – If you are a king then behave like a king, not like a dog you a-hole. I want to yell like this. Yeorum tells him to let her go first. Let me go and lets talk. But he pulls his hand back to slap her. Aooyeon steps in and grabs his hand at that point. He tells this man to stop. His hand is very strong so this big man cannot break ree no matter how hard he tries. Sooyeon tells him that violen behavior and bad language is illegal. You are destroying public property, that costs $20k each. All three are $60k. This man is shocked but tell him, so what do you want me to do? Sooyeon tells him that he ha to pay for everything by law, this is public property. And if you destroy it on purpose then you also have to pay a penalty with additional laws. The man does not understand so Sooyeon whispers in his ear – you are screwed. Cut to the Mooring team leader, he is trying to figure out how things are going with the empty plane spots. They are in a bit of trouble with finding space. he thinks they need to talk to different plane companies to adjust the parking spots. in the air, we see an airplane about to land. They ae getting their orders for what to do to land and start to land. The plane lands well with no problems. Inside the checkout area, the irate man is taken out by the polcie. Yeorum talks to Sooyeon during this episode and tells him that they met this morning. Mini flashback to when they awkwardly met. She asks him how he knows how much all those machines cost. She wants to give him a VIP lounge pass for appreciation. He just sighs and pulls out his badge to show that he workd there. he tells her that it is late to greet her but he also works in the service team. So what should they do, three machines collapsed. Cut back to their team office. Yeorum gets yelled at about the machines while Sooyeon sits. Yeorum says that the customer destroyed it so she heard that he will have to pay for it. But the manager is still upset, how can she let this happen, she was there. She says she did not let it happen, he just did it. But the manager says her specialty was a round house kick, she should do whatever. Yeorum says she will have a salary cut, HR is already looking at her closely. he asks, is that why you did not do that? To be safe? You young kids always have something to say. Sooyeon looks at the situation, he looks like he might be at bit upset by it but does not say anything. Yeorum sits and sighs, he looks at her for a moment. But then the team leader comes in says that she saw bars laying around. The manager tells Yeoreum to do it. She runs to do it but the team leader asks her if she knows where to go? You shuold ask if you do not know. She apologizes. The team leader tells her not to apologize if she does not know what she is apologizing for, is it your habit that you will do all the time? She tells Sooyeon to be her mentor in everything, how to treat customers and everything, yu are responsible for it. He asks why he should do it. The team leader says it is his job now. He just resigns himself to this new job. the manager tells him that he is great, after he became the manager he never said anything like that, “do I have to do it” can you say that….these young kids…ugh. He leaves. Yeorum also tells Sooyeon that she is okay, dont worry about me. She goes out to gather up those retractable poles that are used for dividing and organizing people at the airport. But she cuts herself on one of the detractable ropes. Sooyeon helps her. She tells himnot to, she is not weak woman that makes men do things. Then she trips so he has to catch her. He asks if she wants him to call the service support team? She tells him, actually, can you give me information on Manager Gong? He has some kind of unneccessary prejudice against me. Do I need to do something special to get on his good side? I will be appreciative. Sooyeon tells her that he will tell her where the warehouse is. He asks if she has something to write it down, it can be difficult. She gulps and says that she has a good memory, she will remember. He tells her the directions…go to the bathroom, then to the gate…then 5 meters…then freight elevator…then second floor…then turn right….then go to foreigner area…then you will see a check point….pass that….then you will see a sign for agriculture and animals…left turn toward that….at the end of the hall you will see a secutiry team…left turn…janitor office…ten meters….another elevator but don’t take it…right turn….another door….that is the warehouse. Do you want me to call the service support team? Yeorum is confused but confidentally says, NO I CAN DO IT. He leaves so she deflates and thinks that she wanted to do a good job. But she gets completely lost while looking for it. She grumbles that this is a maze. Cut to the manager yelling at her again about how this job was only 30 minutes of work. Are you hiding instead of working? It took more than 2 hours. Soo yeon told you how to get there, why do you do this? Yeorum goes to the houtdoor rest area and talks to her friend about how Lee Sooyeon is screwing her on purpose. Her friend is Ko EunSub. He knows who Sooyeon is and describes him as a cocky person. But he also tells Yeorum that she gets lost easily anyway. She is all like, whatever, it is a competitive society, how can he do this even though I look like his rival? He tells her that he went to KAIST (Korean MIT) and has the highest marks on his exam and interview. She is all like, what do you mean? So he wont think I am a rival at all because I went to a loval college and am almost on suspension from work? Eun-sub tells her that he has a huge cokcy reputation, he always eats alone and never goes to group dinners and has no friends. He is not even pretending to be friendly. There is a rumor that he is handicapped which is why he does not do anything with anyone. She wonders if he is saying that he does not have social skills? The friend says that actually, that rumor is proven wrong recently. He goes into more detail which is shown in a falshback. there is a person who was moving a lot of heavy equipment too quickly. A little boy loses his ball and runs after it, he is about to her trampled by this cart. But Sooyeon runs in quickly and blocks the boy. ALl the luggage goes flying, but the boy is saved. Everyone sees this. Sooyeon walks away with the kid while the luggage flies around him. Yoeum says he is lying, that is nonsense. Eun-sub explains, that is why it is a rumor. People talk about it and exagerated it and it became a legend. he is super popular after that. He just joined the airport and became a regular for one month after a 3 month internship. So she is actually his sunbae. But he is her mentor. Meanwhile, Sooyeon sees a woman who is worried and wants to find her son. She pleads with him to find her son, please. Somewhere in the airport, Yeorum talks to her boss, Yang about how her hubae is her mentor? How can a rookie be her mentor? He has only worked there for 4 months. The manager wants to know what the problem is. Yeorum says she has her pride, is she being looked down upon? The boss tells her to work properly first. Dont’ be late, don’t make excuses, I don’t care what you did before or your loser metality, I don’t care about anything before, I only care about what you do now, don’t talk about BS seniority, okay? Do you have anything else to say? Yeorum quietly tells her no and then runs off. The team leader looks at her as if she likes her. Yeorum goes to her friend. He tells her that her boss has a reputation of being a ruthless working woman. She even has a nickname about it. But whenever she picks on someone, you are done. Yeorum wonders if she is really being picked on now. Her friend says, yes. Sooyeon calls Yeorum at that time and tells her that they have a lost baby they need to find. Yeorum tells him that she is on her way. She tells her friend that she has to go, she can’t just spend today being picked on by the team leader and the manager. If she does not adapt to this service department then she has nowhere to go. She will work hard and find this lost boy. Her friend wonders why she was late from day one. He gets a beep and then wonders why this airplane came so early today. But actually the airplane has already landed. Yeorum finds Sooyeon who is talking to the woman. She asks him about the lost boy, he is actually 31 years old. Yeorum asks if this is a joke? Sooyeon tells her that he has medicine that he should take in a timely manner, but he was so excited for the trip that he left too early. The medicine is for bi-polor disorder. He tells her to stay with the woman and he will go. But she tells him that she can go and then speaks about how she has worked there longer than him. She thinks he is the type of perso that will make peole work hard and take all the credit so they should work together. They go off together, but he gets stopped by the medal detector and has to show a card to the officer. Yeorum notices this and is a bit shocked by it. He walks to her and tells her that they need to work together, he is bipolar so we are not sure what might happen. She asks him if the rookie is worrying about her? He says no, as her mentor he is advising her. It is okay to bother him personally, but don’t make big trouble. He does not want attention by others. He likes to work quietly and not be noticed. So please work quietly. She asks if they have met each there before. Not this morning, but another time. he says no, never. She thinks, never? But you look familiar to me. He tells her that woman hit on him like this, is this the same type of situation? She apologizes and walks ahead. He smiles a bit to himself. Cut to the man sitting in the waiting area. the entire workforce is looking for him. they have cameras looking for him as well. JUng-hoon is on top of the cameras and says there is no one with a yellow top on. So they start to look for everyone with a yellow top. the man was in the scree, but he was wearing a jacket over his yellow clothing. Elsewhere in the airport, two airlines argue about the airplane that landed early. Tae-hee has to settle this. he tries to tell them that he is on no ones side, he just wants to settle this rationally. But the other two are not hearing it. ALl three argue via phone. there is even a split screen showing all three of them and the workers shaking their heads. tae-hee tells them to complain to the westerlie, not to him. there is no other way, why did the wind blow that way? Time is ticking. Do you want to get a lot of customer complaints and I will release this recording so we sill see who will be judged during insepction later? Is that what you want? Okay? Lets do it! CLICK. On the airplane, there is a delay. Meanwhile, Sooyeon and Yeorum look for the man in yellow. He tells her to wait in the hall and he will look in the bathroom. But then she sees someone with a yellow top and runs after him. The man they are actually looking for is sitting calmly in the waiting area. He ha sa jacket over his yellow shirt. Everyone keeps looking for him. He also starts to get nervous. Perhaps his medicine is weaing off, it might be time for him to take his dosage. At the same time, the early airplane needs a gate opened for them. It looks like they need 40 minutes? A plane arrives, the man gets up to look at it, he pulls out his ticket. But then he has a tiny bit of an attack. He looks like he might be getting confused. He asks a person who works there why the airplane changed? The man says that this airplane will go somewhere after dropping off the customers. But the man is a bit confused and yells. WHY! YOU DIDN’T TELL ME AND YOU CHANGED IT! The worker asks if the man is okay. Yeorum is in the area and notices what is going on. On the camera, Team leader Yang also sees what is going on. She sees that this man has a yellow shirt on that is covered byt he jacket. She tells everyone to go to that location. Then she tells Sooyeon to call Yeorum, her mic is off. They call her, but she is distracted by this man who is hitting the other worker. He is having a full blown attack. Soo yeon runs very quickly to stop this. But he is far away. Yeorum calls the mans nam, Mr. Kim! Mr. Kim stops and looks at her. She tells him that his mother is waiting for him outside, can you go with me? Sooyeon keeps running! Time is ticking. He asks her if she is the police, she says she is not, she just works there. She also tells him that his mother is worried about him, come with me. the man tells her not to come near him! She is there to arrest him! She tells him that she is not thee to arrest him, please calm down. But he lifts up the metal divider and swings it full on at her. She closes her eyes and braces for this quickly coming blow. But then Sooyeon gets there right at that moment and blocks it while holding her protectively. VO – I remember it – this guy…. She remmembers being saved by a flying car that was about to hit her. She reconizes him from that. VO – this guy, is that guy. He blocks the pole, it bends around his arm. Sooyeon tells the man that his mother wanted him to give his medicine to him. His mother is very worried about him. the man takes his medicine and is very calm. Everyone runs up at that time so Sooyeon kicks the pole away under the chairs. the people ask if anything happened? Sooyeon says that the airplane guy was hurt a bit (the airplane guy also saw the pole bend around his arm). The boss tells them that she will get the report later and takes everyone away. Yeorum is still behind and sees that Sooyeon hid the pole. He tries not to look at her and just corrects his jacket. HAVE TO STOP RIGHT HERE, WE HAVE ABOUT TEN MINUTES TO GO BUT WE HAVE TO RUN! Yeo-rem goes to a cafe area and watches the rain fall as she thinks about the day. Her mind goes back to when she met Sooyeon that morning. Her compass stuck to his arm. Then she thinks about him spinning her away from the man which also reminds her of someone that saved her sometime ago. VO – Aboji said there are no coincidences in the world. We see Sooyeon reuniting the man with his mother. It is a tearful reunion. VO – There are reasons for everything that happens in your life. In-woo shows up to the airport and goes through security. VO – Seemingly unconnected moments, after time passes, one by one those moments are start to connect. Sooyeon sees his step brother In-woo walking thorugh the airport. they pass each other, but he does not stop/recognize Sooyeon. Sooyeon looks like a lot of emotions are running thorugh him. Elsewhere, a custodian finds he bent pole and wonders who did this. Later on, A CCTV worker asks Team Leader Yang if she wants to see something. He shows her the phottage of Sooyeon blocking the pole and it bending around his arm. Meanwhile, Yeorum looks for the bent pole. However, it is not there and she runs into Sooyeon instead. they look at each other for a moment and then start walking owards each other. She stops to talk to him but he keeps walking. YR – Excuse me, Mr. Loo Yeon, we met before once, right? He turns and looks at her, then he walks back to her. SY – I told you not to be alone and not to make trouble. I want to live quietly okay. Sorry, I don’t have any memory of you. I have never seen you or met you. VO – No, we met before in that moment. Flashback to Yeorum waiting for a bus at the bus stop. Suddenly, a car flies toward her, it is spinning and hopping and hurling towards her. All she can do it watch it. But even more suddenly, a man pulls her out of the way and protects her from the car that is about to crash on top of them. Yeorum braces herself for impact, however, it never comes. She looks up and sees that Sooyeon has stopped the car with only his hand. He is focused and breathing hard. She faints in his arms. VO – That day was the day of my interview. Back in the airport offices, Sooyeon has a paperclip stick to him. VO – It was definitely you. Sooyeon looks around and then wipes a bit of blood from his arm and removes the paper clip. He opens up his computer and starts to work. Yeorum looks at the rain. You cannot get much better than this in a first episode. I am intrigued to the highest degree. VO – IT IS RED ONE (Code Red). 1-4 team go to the air side, 5-9 team go to the landing side. SK – What? T-2? Did you just tell me to come to T-2? IW – How do you look so cool now? I missed you. YR – Do you know what you are called? SY – Ignore it a little bit and pretend like you did not see it, just live like that. VO – What is his real identity? I loved this first episode! It is very intriguing. I have a feeling about this show; it sounds like a great sleeper. Loved the recaps. Looking forward to watching. Thank you! Yes, this first episode make me want to watch the next one, I’m curious too, I hope it’s a good one. Thank you for the recap!!! !